Australia’s long-time voice of rugby, Gordon Bray, is one of the most experienced commentators in the land with more than four decades in the media. Gordon began a 25-year role with ABC Sport in 1969 as a Specialist Trainee. Following a brief stint with Channel Ten, he switched to Channel Seven where he has spent the last 16 years. At last count, Gordon had called 400 Rugby Test matches as well as all six Rugby World Cups. In addition to his impressive Rugby resume, he has also commentated eight summer and winter Olympic Games, five Commonwealth Games, six Sydney to Hobart races and at least 25 sports at the international level. Gordon is also heavily involved in documentary film making, producing and hosting many TV presentations like Sydney to Hobart specials, Westfield Disabled Games and Swinging Thru Ireland which took viewers on a tour of Ireland’s most acclaimed gold courses. Outside of sport, Gordon is the Business Development Ambassador for Concierge Travel Group which was awarded Australia’s best travel agency, and the SNP Security group, Australia’s largest private security company. Gordon has served as an Ambassador for Legacy for over twenty years, on the council of Pymble Ladies College for seven years, and is part of the advisory board for The Legends Club – a corporate hospitality group. Best-selling book; The Australian Rugby Companion, is one of six rugby titles written by Gordon. 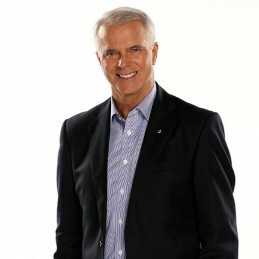 Gordon has received a one-off Prime Minister’s medal for contribution to sports broadcasting, the Order of Australia for services to sports broadcasting, the community and rugby, and the Penguin Award as Australia’s Best Sports Presenter.